Barcelona president Josep Bartomeu has emphatically ruled out selling Ousmane Dembele to Arsenal or any other club in this summer’s transfer window. 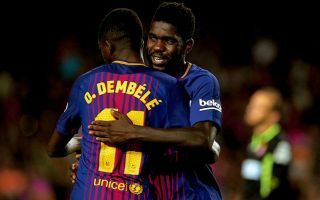 The Catalan giants’ chief insists Dembele is going nowhere and has moved to ease concerns over his indifferent first year at the Nou Camp by saying he and many others struggle to settle in to the club’s style of play at first. It had previously been claimed that Barcelona were actively looking to offload the young France international for around £87million, according to RAC1 as translated by Don Balon. However, Bartomeu has now been quoted as debunking any rumours, following Sport‘s claim that Arsenal had opened talks over trying to lure Dembele to the Emirates Stadium through Sven Mislintat, who knows him from their time together at Borussia Dortmund. ‘Dembele will go nowhere. He and Coutinho are a big investment for us,’ Bartomeu is quoted in Sport. ‘They are very important to our project and we expect a lot from them. ‘Coutinho in the last four months has been very active in the team but Dembele is a very young player and talented and we expect great things. Next seasons will be different. There’s no doubt Dembele would have been an exciting addition for Arsenal after showing himself to be one of the finest young players in Europe in recent times. Still, it may be that it’s an unrealistic transfer for the Gunners for the time being, with Barca not yet giving up on him fulfilling his potential.